Finnabair: Haze and Shine Journal - will it be yours? 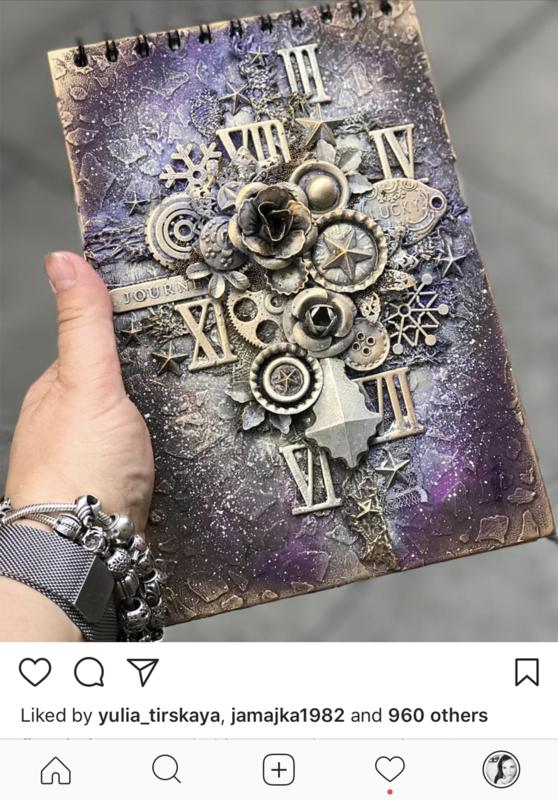 I'm back from my classes in Barcelona - and wow - I'm really blown away with all the love my latest sample I've made in the classroom got from you on Instagram! I'm so happy to see you like my "Haze and Shine" class - this really makes my heart flutter! 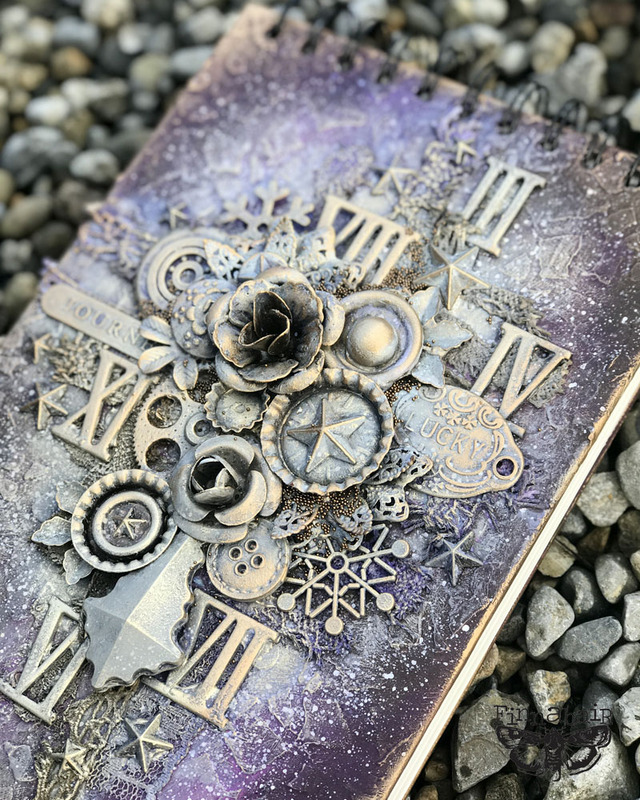 I really like teaching this project too - it is a hand - and pretty - journal which you can use to practice your day-to-day journaling, use it as a notebook, watercolour pad or as a base for a mini album - why not? The best part is you can take all of the techniques we are applying on the cover and use them to decorate almost every surface! This combination of colours and textures, matte and shine finishes - all them together make this look really eye-catching and unique. I love how my Art Alchemy and Art Basics products worked together here: first Modeling Paste, then beautiful, rich Impasto Paints, then Heavy Body Gel together witch my Mechanicals and finally Heavy White Gesso and Art Alchemy Metallique Waxes. Isn't that just a perfect combo? If your answer is yes - then I have a great news for you! - as a small thank you gift for all the support and love me and my Creative Team receive from you every day! How to get the chance to win? The rules are really simple! What is your reason to create? I'll be so happy to read your answers - and this weekend I'll pick and announce the lucky winner! This info you will find on my Instagram account, so make sure you are my follower! The reason I create is that it's good for me. I feel peace, I feel happiness and joy, even if it's a "sad" project. What is the reason I create? I create to express my moods, my thoughts, my passion, my whole self. I create to share and inspire everyone and to teach my son a healthy outlet for your frustrations and your happiness. Creation is an empowering tool has defined me as a whole. I create to release the stress of my job. Working where I work I learned a long time ago, that work had to stay there and I needed something to keep my mind and my hands busy, creating did that for me. Thanks for this chance! I love creating because it gives me great satisfaction and makes me feel good, productive and fulfilled. I create to escape the "everyday" world. When I create, I don't think about work or cleaning. I get such a great feeling of freedom. You are an incredible artist and I wish that one day I will get the chance to be in one of your class. Thank you! While creating, nothing else matter so I guess is some type of evasion! It is also for me a great way to balance things with a work that is very analytical. Thanks for the chance,I love your work Finn! my reason to create is to disconnect from the daily routine, to put into practice beautiful projects, to learn a thousand and one techniques of great artists like you, and all your works !! I create because it makes me happy in so many ways. While I'm creating I am focused on what I'm doing, not what is going on around me. I love colors and have filled my life with color. And, most of all, I enjoy giving away my creations. There's so much to be happy about. I create for stress relief. I get to forget about all my daily obligations and just enjoy the moment. Creating is my! It fills my soul with colors! I create to keep myself grounded. I find a sense of peace while working on a new project or a new technique. There's also a wonderful sense of satisfaction in the completion of something that is totally your own. Thank you, Anna, for the inspiration you have provided to me! I create as to create is to live. its an expression of our feelings, our imagination and our souls. It allows us to give others a glimpse into our true selves and allows us to show who we are. It's essential to me and grounds me in difficult times. I love to create because it helps me emotionally, spiritually and physically. It gives me such satisfaction and excitement and pleasure and helps alleviate stress. I really love sharing my passion and creating with friends. Gorgeous journal cover. Thanks for all the inspiration :) I create because it allows me to express myself in a way that words cant do. Your project is gorgeous!!!!!! WOW! I create because it helps me to relax. Scrapbooking is a wonderful hobby. I love it! I create art primarily because I enjoy the process. It's fun to create and it is also a need, it gives me joy and makes me happy!! First I have to say that Journal is Stunning!!!!! But why do I create??? I create to keep my mind calm and my heart happy.. it's the one place in my house (and life) where it's all about me and what makes me happy..
My reason to create is well I feel like I am driven, and also it is so good for me. I love to create for many reasons, the first being it brings absolute joy to me and the special people I share my art with. Creating with my 13 yr old daughter is something we both share together, bonding with her over our art projects together is the most special thing ever gifted to us! Creating lifts my spirits when Im down, getting out my emotions in a positive way is so healing for the mind and soul! Thankyou for your inspiration and a chance to win this awesome journal! it makes me happy:) it helps to get rid of negative emotions, allows to stop for a while and enjoy the moment ...it is like tea drinking - makes me forget the noize of this world. Thank you so much for this chance. I fell in love with this notebook cover the moment I saw how it literally shinning in your instagram ! Awesome journal! Love the colors and textures! I create to share my love of cardmaking with others! I create because it makes my soul happy and keeps depression at bay. Thank you for the amazing opportunity to win!! I love to create, its so amazing to start off with a blank canvas and just play,enjoying yourself.Trying something new,doing thing differently. Transforming your project with colour, shape and embellishments. Then sitting back and being proud of what you have created.It helps me relax and for the time while I am creating takes my mind away from my problems of everyday life.My happy place. I create because it makes my soul happy! :) Each day may have more than just that 1 reason, but when I thought about it, it's my soul that is happy when I art. :) It just makes me feel peaceful. 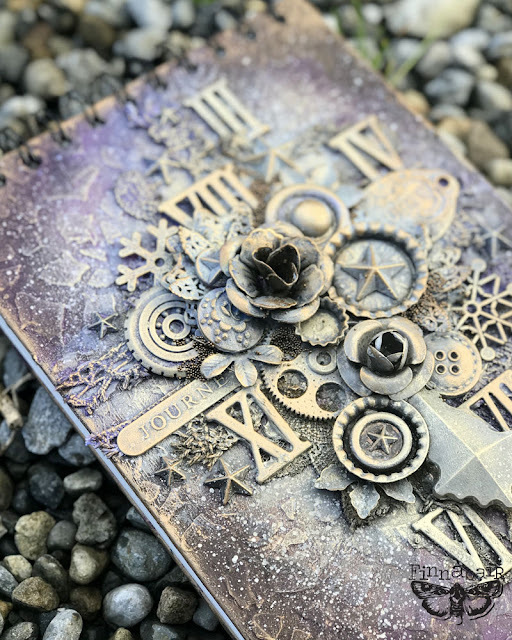 Love your gorgeous journal cover! I create because it gives me the energy to tackle parenting my 5 kiddos. Time spent creating helps me re-center myself, my thoughts and everything about life. I've been able to process so many things while creating, whether it be parenting challenges, work stresses, or worries about my husband's health (he's a cancer patient). All of those burdens seem to lessen after I've spent a few hours making something. One of my favorite things has always been journaling, largely because I am a writer by trade. I'll try to keep this to a minimum.... my reason to create is because I am a caregiver for 23 years. My son needs 24/7 care and it is hard watching him suffer every single day. When he falls asleep - I have to admit it is my favorite time of every single day.... I put a brush or a pencil in my hand and I just create - I have no plan - I just create - mostly to help me release the challenges throughout the day (if he was having more seizures or if his behaviors were out of control); also to clear my mind to help me fall asleep. Art literally saves my life - it helps me to keep little piece of me...... I wanted to add that I love your blog - I love your creative team and I enjoy every single piece of art that is posted. I love the videos and the tutorials and your products are the best! Good luck to everyone!!!!!!! The journal is lovely!!! Boy, would I love to win it! Please add my name in the hat. I create because it is fun!!! I really throw myself into my art and when completed, it gives me such a sense of accomplishment. I create to give away small pieces of me and make people happy. I create because I LOVE IT. I create because it is my strees reliever. I create because it allows me the opportunity to meet like minded people and create awesome friendships. I create because i can. I create fill my home with special memories. I create because it makes me happy. I’ve been lucky enough to take multiple classes you’ve taught and you are amazing. Simple... creating makes me feel alive! Love the journal, looks a little bit like what we did in Waxahachie. I have your class projects up at work and every day someone comments on how awesome and creative they are. And I have to agree. Those were some of the best classes! thanks! A gorgeous journal and it's my favorite color! So much amazing texture. I love creating because it makes me feel accomplished to make something with my own hands that brings me pleasure. I love being able to pass by my craft table, sneak a peek of my project and feel satisfaction that I like it. I also find creating art helps me express my feelings. Art journaling is my favorite media at the moment and I have found that it has been therapeutic through a loss. And best of all, creating time is ME time...which is something that I could always use more of. I create as therapy. It helps keep me sane! I also love that I get to make cards that make others happy! Hi Anna, I love to create as it gives me peace and freedom to do as I please, it lets you into another world. Thank you for the classes that I did with you in Drouin in Australia. That changed my whole perspective on creative art. thank you for the wonderful opportunity to be a part of this. Creation is a vital need, it's a whole world, in which the boundaries between imagery and reality are blurred! I really like to feel the results of creation physically: touch, feel and see ... This is magic! I am amazed with your creations and wish to buy waxes to work on my wishlist projects... The reason why I create is it bringa life to my soul, I cherish every single moment while creating, it fills my inner self with peace, joy and stress free mindset. I love every bit of your projects and blessed would be the one who will receive this wonderful art piece of urs.. tfs! I create to help maintain balance in my life. As an artist, I find that I can get grumpy and all out of sorts if I don't make the time to create it. Even if it's only a few minutes a day. that helps me find balance and a quiet time for me. I can`t work anymore because of rheumatism, and I started creating cards to have something to do during the day. Now I am addicted. And I love to be inspirer by Pinterest and lovely nature. I create to help me relax. Working long hours stops you switching off so I pop in the craft den when I get home and use my mind in a different way. I create because it makes me happy. Simple as that. If I do not create for a while, I am grumpy! The reason I create is because I have to,I love mixed media and just have to get my expressions down on the paper,there are no mistakes just self expression,it is just so relaxing time has no meaning,it makes me happy. Thank you so much for this opportunity I love your work. Hey Anna...Firstly the journal cover is to die for....your work never fails to amaze me...I missed out on the workshop in India...but I would love to meet you someday in near future..fingers crossed. Its really generous of you to giveaway this journal to one lucky person...hoping its me!!! The reason I craft and create is because it brings me peace and happiness. I do not craft to show others or sell...its a hobby for me and I indulge luxuriously into it. And the joy to see the end product is deeply satisfying....I am sure you can associate with it. The reason for the creation? It's an escape from reality, from stress, from bad thoughts, escape to happiness, into creativity, in good weather, when you are inspired by the work of the Masters, beautiful flowers and colors, interesting assignments, your friends and family, your favorite city and many different things around, which need only be discerned! What a gorgeous album Anna. Your products and techniques and classes that I have attended have really shaped my creative process and helped me to be free with my art! I love your work, creativity, classes and ideas. I create for many reasons, it is definitely relaxing from my stressful full time job and brings me joy and peace. I love when people are happy to receive handmade items, as I think it brings joy to them, as well. Your journal is beautiful and I would be honored to be the winner :). So pretty! I create it makes me happy. I spend too many hours working and taking care of my kids that it is a great way to get some calm alone time. Thanks for all of the great inspiration! What a beautiful project! I love all the dimension. My reason to create, when I can squeeze it in..is to escape for a while, and the satisfying feeling of making something from nothing. The power of my creation comes from the surprises it brings to me. I like to experiment and get different thoughts. I create because it allows all those ideas in my head to make an appearance in a tangible form. I love to express myself and leave a legacy. Thank you for a chance to win. Your work is so amazing. I create for multiple reasons but mostly because it's my passion. I feel the need to create, it fulfills me. I think I would lose my mind if I didn't let my creative thoughts out!! It brings joy to others and that makes me happy! My reason to create is positive mental health. Creating is all consuming. It pulls me out of the day to day chaos and drama into a restful quiet place, where I can renew my spirit and then get back out there with gusto. I create because I love that feeling when the idea and the medium are coming together. I can lose myself in the process of making something beautiful. Prayers for your husband. Keep creating and never lose your passion. Thank you for the magic opportunity to receive a gift made by your hands! I love your art! I do creativity to make the world around me better, kinder. At least for me and my loved ones. A most gorgeous Journal and such a gracious giveaway Finn! My reason for creating is because it feeds my soul, it is part of my everyday being for wellness! Simple as that! I create because I love to see things come to life by my hands, using simple or cast away items and play with bringing them to life. I have a high stress job and love coming home and relieving all the stress of the days. First of all thank you for this huge opportunity...then...my reason to create is, mostly that is cheaper than therapy! Chuckles aside I do find that it is such a stress relief...even when my project takes an unexpected turn, it's a way to learn something new. So, in the end, the reason I create is because it's how I express myself. Creation is an empowering tool has defined me as a whole. The reason to create is both simple and complex at the same time. It brings joy and fulfillment during the process, opens up the mind and spirit and clears the cobwebs, and fills you with anticipation and forboding all at once. It's healing power is underestimated as it resores the gift in you. As a follower on Instagram, I commented how I love your color pallette for this project. I also adore the texture you created. It is beautiful! I love your creative expression. Why do I create? Why do I breathe? It's because that is how I was created. I love this question. I absolutely love this journal, the light shining through it is beautiful. The reason I create is, it just plain makes me happy. If I am in a down or angry mood I bring out my “bad mood” journal and the art process calms me down and always lifts my mood. And my other journals are so much more colorful and involved. I’m am getting happy just talking about them, lol. I create because I have to. It feeds my soul to the very core. I have such faith in the connection to art and freedom of spirit. It raises me up and helps me to feel I am able to conquer another day, and it brings me peace. Thank you for all of your wonderful videos and talents that you share with us! Bless you, Anna! I absolutely love that journal! I create because it makes me happy! Your journals are truly amazing! You are very kind to give one away. I'm a teddy bear artist so I create because I believe we all need something to hold onto. Something that makes us feel better, something we can hug. And because the world can be a hard place at times, so we need everything we can to make us happy and make the world a more joyful place! It’s easy, because it’s one of the things in life that make me happy! I discovered the mixed media thanks to you Anna. one day I came across your instagram account and I'm falling in love with your work. I always liked to create but I did not feel the soul of an artist, and that's what I like in mixed media is that everyone can do it, are not a great painter or a great artist. Absolutely love all your work. The reason I create is that it always was my childhood dream to be an artist but unfortunately i wasnt able to fulfill that and i had to leave school at the age of 11. Then i went on to get married and have two beautiful children. So my life was pretty busy as a full time mum. Now my kids have left home and i realised i can pursue my childhood dream and do what really makes me happy. So on the 1st of January of this year i made my first art journal page and haven’t looked back. I create mainly for myself. For taking out all that repression and depression accumulating everyday (from my family, for my situation of being jobless, for my sentimental problematic situation). I always loved to draw and create since i was little. Art school didn't gave me what i was searching to learn and didn't gave me a job. But i started to create jewelry and seeing happy people that wanted to buy them and gave me compliments gave me the strenght to continue, also if people continued to keep me down with "the hard reality". I don't want to take this side of me away. I want to continue to create. Also if someday i will find a "grown-up" work. Or maybe one day i will make what i love into a real job. It's my dream. I create because it makes me happy and I love sharing my creations with other like minded crafters. I also love that the crafting community is so generous in sharing their projects and techniques. I am crafty like my g.mom, maybe some hyper activity because I always have do do something with my hands. I see something I like so I create one for me. My passion was drawing and painting when I was young now its papercrafting and mixed media and of course you tube videos. Love your products, Prima is so lucky to have you. I create because it brings me joy and happiness. I love to learn new things and try new things, even when they don't turn out, just the process is so much fun. It helps me to get out of my way and just enjoy using my mind and talent in a productive way. Thank ou for the chance to win this gorgeous journal created by you. I was fortunate to take a class with you in Indiana in the United States. I was awed. I came home, bought all kinds of your stuff and there it sits. For some internal weird reason I just won't allow myself to create. But I follow everything you do and someday I will. You're an awesome individual. I craft because it takes my mind off of all the day to day stressful things and it makes me feel good about myself, like look what I did! I love new things and trying new techniques! I crate because I enjoy it! 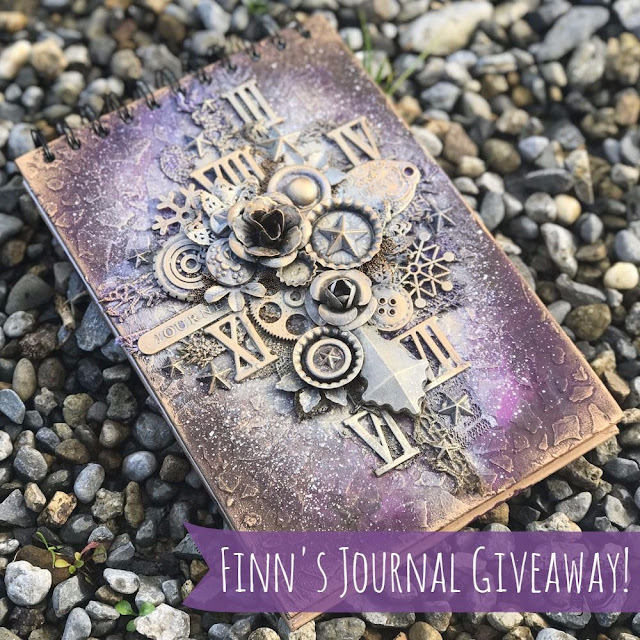 I 'd love to win this gorgeous journal! I never thought I had any creativity or artistic talent. About a year ago I started doing art journaling by chance and instantly fell in love with it. I create because it makes me very happy and I feel that I have a small talent for it. I’m still learning and experimenting and having a lot of fun!